Gearcon is proud to serve the Deep Hole Drilling needs of Edmonton, Red Deer, Calgary, and Nisku areas of Alberta since 2011. Gearcon's state of the art drilling machine provides our customers with superior quality components at a lower price point than competitors, exceeding expectations with every job. One of only three machines worldwide, our custom spec, touch screen controlled, horizontal machine utilizes the BTA STS Deep Hole Drilling System for solid drilling and counter boring. The part counter-rotating head assures maximum part concentricity and provides high quality surface finish that most often eliminates the need for secondary finish machining. 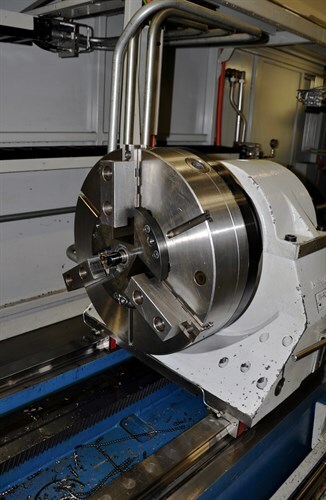 Our machine is capable of holding a tolerance of up to +/- 0.010” of the drilled size, and maintain concentricity of 0.005” per 12” of drilled material. The drilling oil flow rate of up to 340 lpm allows sufficient chip evacuation from the work piece, guaranteeing a smooth surface finish. Drill diameters range between 1.25” and 5.75” with up to 168” drill depth.